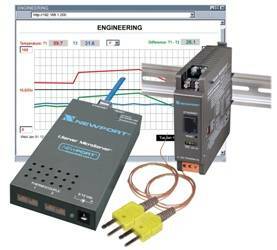 The Newport iTCX transmitter let’s you monitor temperature from two independent thermocouple channels over an ethernet network or the Internet with no special software except a web browser. The Newport iTCX serves active web pages to display real time readings, temperature charts, or log data in standard data formats for use in a spreadsheet or data acquisition program such as Excel or Visual Basic. The virtual chart viewed on the web page is a JAVA Applet that plots a chart over the LAN or Internet in real time. With the Newport iTCX, there is no need to invest time and money learning a proprietary software program to log or chart the data. The iTCX transmitters can take thermocouple types J, K, T, E, R, S, B, C, N, and L measuring temperatures up to 1,820°C (3,308°F). The iTCX can display and chart absolute measurements in two locations and a differential measurement between the two locations. Newport Electronics, Inc. began manufacturing instrumentation in 1965 and quickly earned a reputation for designing and building the world’s most accurate industrial meters and controllers. Newport instruments are designed and manufactured in Santa Ana, California, U.S.A.